Fish are often thought to create a maintenance problem in garden ponds. Actually, they can enhance any ecosystem and reduce pond maintenance because they actually graze on string algae and feed off of the bottom of the pond. They also feed off of the top of the pond and can be a tremendous help eating mosquito larvae, helping to keep you garden pond area free of those pesky insects. 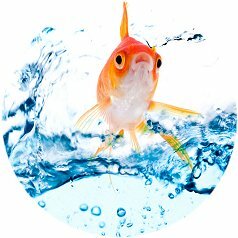 The secret of fish-keeping is to know which type of goldfish you are introducing and what their needs and compatibility are. Goldfish are considered cold water fish. There are several types of goldfish that can live quite nicely in your backyard pond. Some can withstand nearly anything. Some are more delicate. There are many more not mentioned here, but these seem to be the most popular. The information below will help you decide where to start. Comets are the most common and hardiest. They are a long-bodied carp-like goldfish with a single tail and come in gold, white, marble and black. Comets grow to 6" - 13" and can survive for years in a moderate climate. Shubunkins grow 9" - 18" and are always calico colored. They cause little damage to plants and can be mixed with each other and Koi as they are of somewhat similar characteristics. Comets are the least expensive of the pond fish family and can often be found at pet stores in crowded tanks sold for pennies as "feeders" for species that eat live fish. Fantails are the most delicate and least aggressive. They are fat-bodied goldfish with spectacular long flowing tails. Colors are varied and mixed. They grow 6" -10" and can live up to 10 years if kept with consideration. Fantails should not "winter over" in your pond in colder climates. 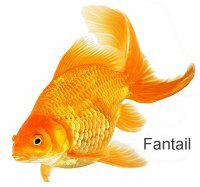 Fantails should not be paired with single-tailed (carp type) fish such as Comets, Koi or Shibunkins. They are usually inexpensive when small but can be expensive when large. They make easy prey for racoons. 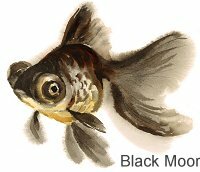 Derived from the Fantail, Black Moors can be extremely beautiful. They grow to about 6" and can live extended life spans. They come in only one color: Black to Bronze. But their fat body, flowing tail, and telescoping eyes are very beautiful. They are slow swimmers. Their vision is poor, and their eyes need some consideration. They should not be kept with other, more aggressive fish such as Comets, Koi or Shibunkins who may pick at their eyes. The pond should not have sharp or protruding decorations, as these fish cannot see well and might damage their eyes on sharp obstacles. 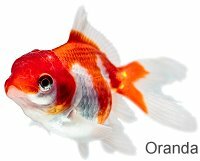 Another type of spectacular Ornamental Fish, the Oranda is an extremely colorful and exotic species. Colors are nearly limitless from spotted to calico to red, black and even blue in a myriad of patterns. His head sports a "hood" or knobby growth characteristic of this gold fish alone. He is fat-bodied with a fancy tail. Like fantails, Orandas are a little more delicate than Comets or Koi, and they should not be left in the pond during cold winter months. Orandas should not be paired with single-tailed (carp type) fish such as Comets, Shibunkins, or Koi. Koi are considered the Cadillac of pond fish. They are long-bodied and multi-colored - often with striking butterfly patterns on their backs. Because they can grow quite large, reaching 24 inches in length, good water maintenance is a must. A 24" fish can be very dirty: lots of food going in, lots of waste coming out. Koi are somewhat more disease-prone than Comets and Shubukins, and they also cause damage to plants. They graze on any plant material, eating the root first and then the leafy parts. They also love to dig in pots and generally make a muddy mess. To protect plants from Koi, wrap the plants in large wire fence barriers. Koi are often quite expensive, but small, mass-bred specimens are not too bad. How many fish in your pond? A good rule of thumb is to stock your pond with no more than one to three inch of fish per square foot of surface area (the depth makes little difference here) That 24" Koi needs a pond surface area of at least 24 sq ft all by himself.